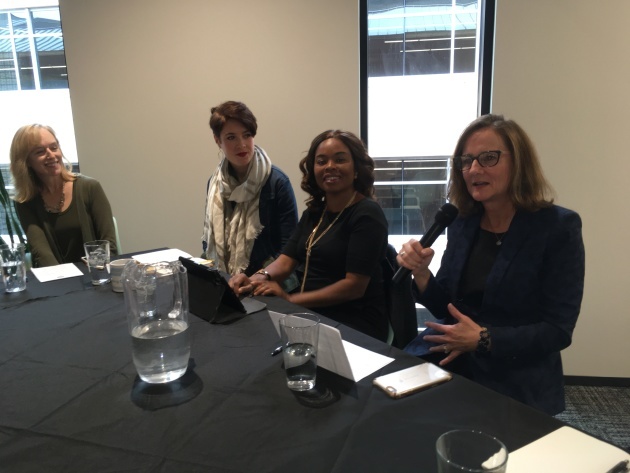 Moderator Susan Hammel (left) of Cogent Consulting, led a discussion that included Danielle Steer, Kenya McKnight Ahad and Sara Russick (right). The vast majority of traditional venture capital flows in multi-million-dollar baskets controlled by white guys from the right schools to mostly white-male-owned enterprises, mostly on the East and West Coast. Yet, the emerging profile in small business, also the growing demographic profile of the United States, is usually underfunded businesses started by women and people of color. Indeed, about 100 people, mostly, young, about half female and minority, turned up to listen to the laments, opportunities and successes involving boot-strapping, diverse entrepreneurs. The panelists considered traditional sources of capital for storefront entrepreneurs, particularly in inner-city neighborhoods, from savings to family to foundations, nonprofit and even government programs that have helped dozens of Twin Cities businesses fix up a shop or cover initial inventory. Some wealth managers and foundations have started “impact investing” and “patient capital” funds that many invest in smaller amounts, expect less return and a longer duration. The panelists come from different backgrounds but reached similar conclusions. “It’s very important for me to ‘close the gaps’,” said Sara Russick, a successful entrepreneur who sold the business she and her husband founded years ago to start the Gopher Angels investment group and who also runs a fund that invests in women-led health businesses. Julie Lein, a co-founder in 2012 of Tumml, the San Francisco-based startup hub for urban tech companies, has launched with a partner a $24.5 million Urban Innovation Fund focused on the needs of urban dwellers, an increasingly diverse market. Her associate, Andrew Felbinger, just opened a Minneapolis office at the Impact Hub above Finnegan’s brewery Downtown. Also of note, Habitware, the young company that won the Minnesota Cup entrepreneurial competition Monday night, was started by a woman, Aneela Idnani, the daughter of immigrants.